Anisette, or Anis, is an anise-flavored liqueur that is consumed in most Mediterranean countries, mainly in Spain, Italy, Portugal, Turkey, Greece, Lebanon, Cyprus, Israel, and France. It is colorless, and because it contains sugar, is sweeter than dry anise flavoured spirits (e.g. absinthe). 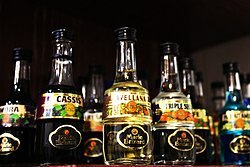 The most traditional style of anisette is that produced by means of distilling aniseed, and is differentiated from those produced by simple maceration by the inclusion of the word distilled on the label. And while Pastis is a similar-tasting liqueur that is prepared in similar fashion and sometimes confused with anisette, it employs a combination of both aniseed and licorice root extracts. Sambuca is essentially an anisette of Italian origin that requires a high minimum (350g/l) sugar content. The liqueur is not commonly taken straight on account of its strong flavour. It is often mixed simply with water, where it produces a milky white consistency. All the liqueur has to be dropped into very cold water at the same moment. Pouring it from a bottle even quickly does not produce the same result. A very white liquid denotes that a good anisette has been used. Spain: Anís del Mono ("the monkey's anisette") has been produced since 1870. The label, with a monkey holding a scroll and a bottle, was designed by Ramon Casas i Carbó. It is the anisette of choice in Malcolm Lowry's Under the Volcano. Characters in Ernest Hemingway's novel The Sun Also Rises and his short story "Hills Like White Elephants" drink and discuss Anís del Toro – "Bull's Anisette." Another type, Aguardiente de Ojén (es), gained fame abroad and is popular in New Orleans, Louisiana, especially during the Mardi Gras festivities. Anise-flavoured alcohols from other parts of the world include Aguardiente from Colombia and Mexico. Anisette is used in modern occultism and spiritual practices to make "spirit water", which is used as an offering for various deities and spirits. ^ a b "History of Marie Brizard" (PDF). Cocktail Times. Retrieved 2 January 2018. ^ Blue, Anthony (2004). The Complete Book of Spirits. New York: HarperCollins. p. 283. ISBN 0-06-054218-7. ^ "REGULATION (EC) No 110/2008 OF THE EUROPEAN PARLIAMENT AND OF THE COUNCIL of 15 January 2008 on the definition, description, presentation, labelling and the protection of geographical indications of spirit drinks and repealing Council Regulation (EEC) No 1576/89". Official Journal of the European Union. European Union. Retrieved 28 October 2016. ^ Eaude, Michael (2007). Catalonia: A Cultural History. Oxford UP. p. 113. ISBN 9780199886883. Retrieved 5 February 2013. ^ Lowry, Malcolm (2012). Under the Volcano: A Novel. Open Road Media. p. 24. ISBN 9781453286296. Retrieved 5 February 2013. ^ Hemingway, Ernest (2006). The Sun Also Rises. Simon and Schuster. p. 162. ISBN 9780743297332. Retrieved 5 February 2013. ^ Sources: Spiritual healing network, Spirit info, Witches of the craft Accessed 29 December 2017. This page was last edited on 28 March 2019, at 22:49 (UTC).